Not satisfied by just dominating most of the world, Google continues to expand into every possible field that a human being might use to gain or transmit information. Google has a strong hold on the e-mail market, the search engine is the number one website in the world, Google TV is on the way and now Google has its eyes on the Internet telephone field currently dominated by Skype. If you have an email account with Gmail, you may have noticed a new “call” button on the side of your screen, just below the “chat” IM function. The pop up banner pointing right to it with the lines “Free calls to the U.S. and Canada in 2010”, and the “Insanely low rates for international calls”, is kind of hard to miss too. In other words, Google wants people to know that they are now players in the voice-over-IP field, and they want your business. Once you install the new program that takes just minutes, users will have voice and video chat immediately available. The rates will be cheaper than a standard landline, and according to Business Insider, the metered rates are lower than Skype’s in most countries. Google’s software does not yet offer an unlimited calling plan though, as Skype does. 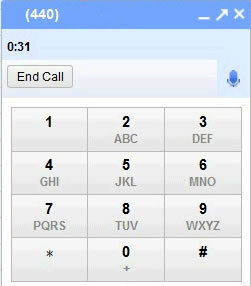 Once you are ready, you will be able to manually dial any number you want. You can also choose anyone in your contact list and dial them with the click of a button- assuming they also have the Google voice and video chat up and running. All you need is a microphone and you are set. Google has released this handy video to teach you how to use a phone, if you were confused.